There are two types of rootworms. 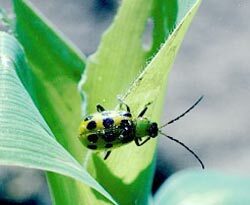 The northern corn rootworm is a pest mainly in the upper Midwest; adult beetles are greenish-yellow and about 1/4 inch long. The southern corn rootworm is green with black spots or stripes and is found all over the United States east of the Rockies. Striped and spotted cucumber beetles are close relatives. Larvae of these beetles are 1/2- to 3/4-inch-long, white wormlike grubs that tunnel into and feed on the roots of corn plants, making them stunted, yellow, and unstable. Adult beetles lay orange eggs at the base of corn plants, then feed on corn silks, pollen, tassels, and occasionally leaves. Corn rootworm is most likely a problem in gardens where corn has grown for two seasons or more. Other favored hosts include cantaloupe, cucumber, muskmelon, and squash. Spotted cucumber beetles show a preference for roses and dahlias, among other garden plants. Grow corn in a different location every year, and reduce surrounding weeds where adults hide. Encourage natural enemies such as birds and tachinid flies with habitat improvements.